Happy Friday, everyone! We're wrapping up another busy week at Haystack TV, as we prepped for our new iOS 9 features to go live. 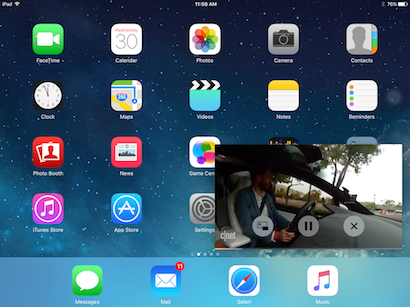 If you already have the iOS 9 update, here are some cool things you can now do with your Haystack TV app. We're super excited about this new feature. This iPad-only multitasking tool allows you to keep Haystack TV playing while doing something else on your tablet. Feel free to watch your headline news channel while browsing social media, checking your email or even searching the web for more background information on a news topic you're interested in. Want to learn more? The Streaming Media Blog did a great feature about us and how 'picture-in-picture' works. 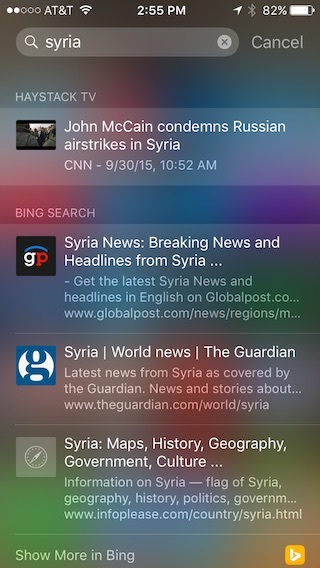 Searching for news videos in Haystack TV is now easier than ever with spotlight search. On your iPhone home screen, swipe down to get to spotlight search, and type in the topic you're interested in. Your phone will automatically search for matching videos within our app. Finally, let's talk about the new support for universal links. When you open www.haystack.tv links from our website on your mobile device, you will now get directed straight to our app. Watching and sharing videos from Haystack TV is going to be easier and more streamlined! Give these new features a try, and let us know what you think. A few weeks ago, we announced that we were chosen as one of the 10 finalists for Twitter’s very first worldwide startup competition — Hatch. Last night was the night. 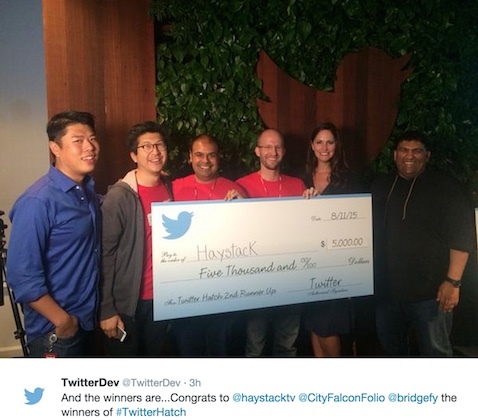 Ten startups selected from 30 countries presented their products to a panel of judges at Twitter headquarters in San Francisco, and we’re excited to announce that Haystack TV was one of the three winners! It was a lot of fun getting to meet so many fantastic startups from around the world. 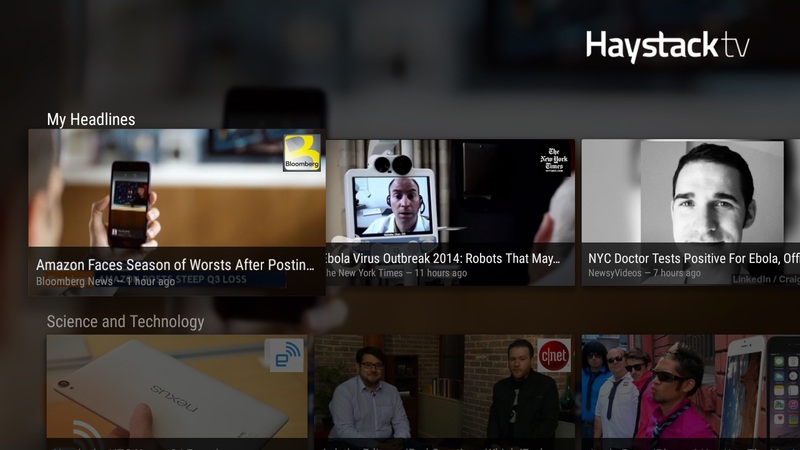 Also, Haystack TV 2.0 went live this week. This is our biggest update yet, and it allows users to better tailor their daily news headlines. With the new profile page, users can now add favorites on thousands of people, places, topics and sources that we categorize across thousands of videos each day. There is also a mute function to exclude any topic or source. You can download the update on both iOS and Android. We hope you'll give it a try and let us know what you think! Finally, we’d like to take this opportunity to thank all of our users for your continued support. We couldn’t have done it without you! Here are some pictures from Twitter Hatch. We believe staying informed is important and understand that news should be available to you whenever you want it. That’s why we’ve worked hard to make sure Haystack TV is available on all your screens -- your smart phone, tablet and even your home TVs. We’re excited to be featured on the Google Developer’s blog today, especially when many of our users have expressed that Chromecast is their go-to device when it comes to watching Haystack TV on the big screen. If you haven’t tried Chromecast yet, you’ll find that it’s the perfect complement to the Haystack TV app available for Android and iOS. As soon as you open the app and tap the Cast button, your phone turns into a powerful remote control. You can browse headlines, select stories to play and even remove videos from your queue without disrupting what’s casting to your TV. We’re excited to be part of this TV revolution and hope you’ll continue to join us on the journey. 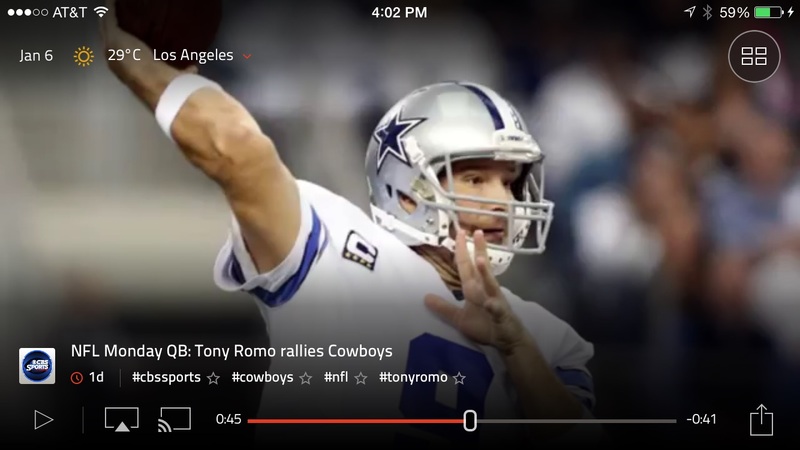 Haystack TV comes to iPhone! 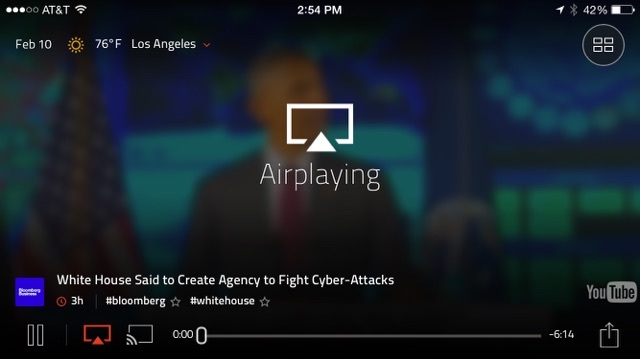 Starting today, Haystack TV is available for the iPhone! Haystack TV first launched on iPad last March and since then we've received amazing feedback from our users. Even though the iPad app has consistently received 5-star reviews we felt as though we needed to create a new user experience suited for a smaller screen. We took everything we had learned from the iPad app and built a new app from the ground up in order to create a way to watch news that was best suited for the iPhone. We noticed that our existing users love the "My Headlines" channel that we build for them each time they open Haystack TV. Each user's headlines channel is different, and is based on both their interests and what's trending and important in the news. When you launch the iPhone app you're immediately taken to a fullscreen mode for watching your headlines. You can swipe back and forth between videos, and the video switching is fast (we call it “instant playback”). As you watch and skip, Haystack TV learns more about you so we can better tailor your headlines to your interests. Swiping isn't the only way to access more video news on Haystack TV. If you tap on the grid icon in the top right corner you can easily hop from one of your favorite channels to another. We source content from hundreds of publishers and give you the best of what’s trending day to day. But we took browsing one step further. We realized that people love to keep watching a news video while browsing. So we created a “mini-player” at the bottom of the screen, which allows you to keep watching your current video while you use the grid view. This simultaneous browse and watch mode makes consuming video news really efficient, and entertaining. Haystack TV works great when you're on the go, at the gym on the treadmill, or while you're shuffling around your home doing errands. But if you’re in the mood to watch the news on your TV you can do that too! Tap on the Airplay button and your video will immediately start playing on your Apple TV. 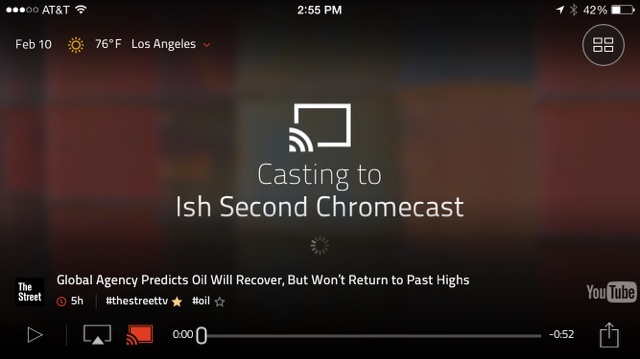 Or if you have a Cast-ready device like a Chromecast, tap on the Cast button. Your phone acts as a remote control to watch the news on your TV! This is just the beginning. Our goal is to give you a great customized, leanback experience for watching the news, that is easy-to-use, entertaining, and most of all, informative. We have a great roadmap full of great features planned for the future. If you have ideas or suggestions just email us: founders@haystack.tv. We would love to hear from you! Haystack TV comes to Android TV! 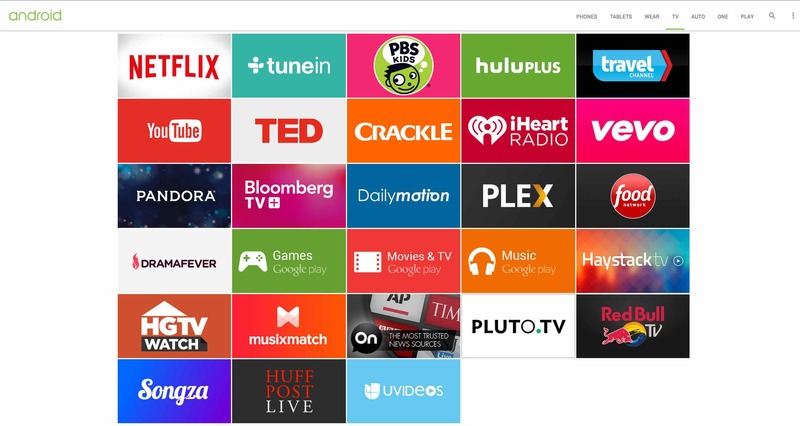 We’re pleased to announce that Haystack TV has been selected as an initial launch partner by Google to bring its personalized news service to the new Android TV platform. 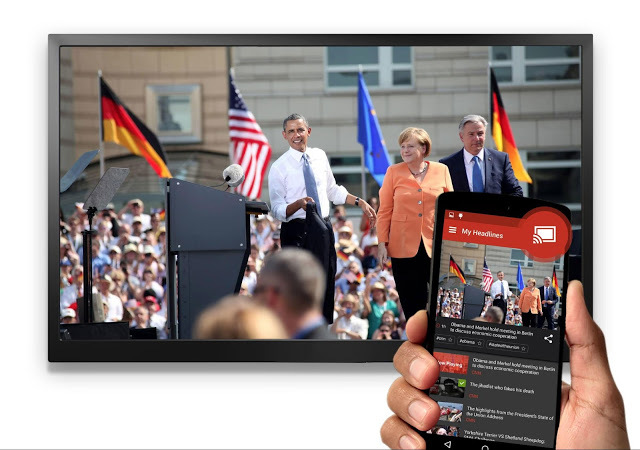 We got great feedback from users who use our app with Chromecast to stream news via our Android and iOS apps. So Android TV seemed like a logical next step to allow users to bring the best video news service into their living rooms. Haystack TV picks the most important video news and presents it to you in a headline news channel tailored to your interests. It’s ideal for news junkies and cord cutters who want to stay informed about the news they care about. With this release we wanted to provide a simple, intuitive UI. The first time you open Haystack TV we ask you for your preferred categories. From there we scour the internet and put the best news in your ‘My Headlines’ channel. You can turn on your headlines, sit back, and watch the latest developing stories. 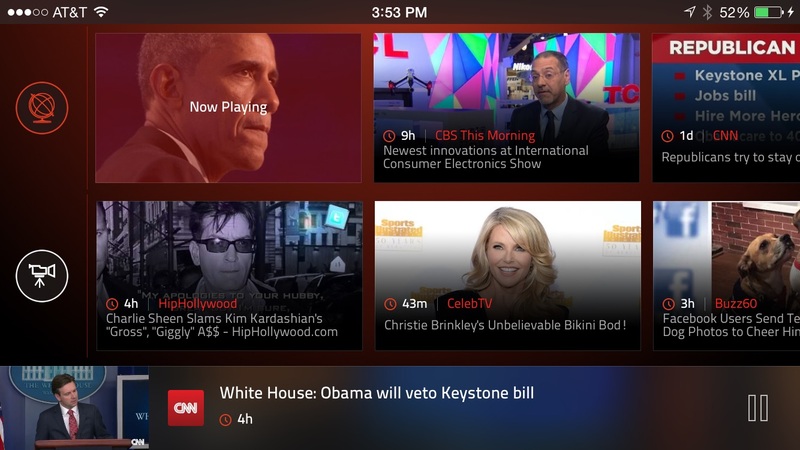 As you use Haystack TV, it adapts to your tastes and gets smarter about what news videos it should show you. We also provide additional channels so you can navigate news across current events, entertainment, business, sports, and technology. Or simply switch to our late night channel for a nighttime laugh for the best from Jimmy Fallon, Jimmy Kimmel, and Conan. You can find Haystack TV in the Google Play store on your Nexus Player or other Android TV compatible devices and television sets. We’re proud to be featured alongside such as apps as Netflix, TED, and Hulu Plus and many others.